In no respite to the wave of fiery protests inside Tibet, a second Tibetan today set himself on fire protesting China’s continued occupation of Tibet. Tibetan self-immolator Kunchok Phelgye in an undated photo. DHARAMSHALA, December 8: The alarming escalation in self-immolation protests continues in Tibet with another Tibetan setting himself on fire protesting China’s continued occupation of Tibet. In fresh reports coming out of Tibet, Kunchok Phelgye, a 24-year-old-monk from the Sumdo Monastery in Dzoege region of eastern Tibet passed away in his self-immolation protest today. The exile base of the Kirti Monastery in Dharamshala, in a release, said that Kunchok Phelgye set himself on fire in front of the main assembly hall of the Taktsang Lhamo Kirti Monastery at around 5:20 pm (local time). Kunchok Phelgye succumbed to his injuries at the site of his protest. Monks of the Monastery surrounded Kunchok Phelgye’s burning body and began to recite the prayer, “Losang Gyalwa Kungi Nyingje Ter…” (usually recited in Kirti Rinpoche’s honour). Later, Kunchok Phelgye’s body was carried to his quarters in the Monastery where hundreds of monks and local Tibetans continue to visit to offer their last respects and prayers. 24-year-old Tibetan monk Kunchok Phelgye's body burns outside the Taktsang Lhamo Kirti Monastery in Dzoege, eastern Tibet after he self-immolated demanding the reunification of Tibetans on December 8, 2012. “Right now hundreds of monks are gathered and offering prayers for the deceased,” the release said. "Local Chinese authorities have now placed Taktsang Lhamo Kirti monastery and the surrounding villages under security blockade." Kunchok Phelgye has nine members in his family. His parents are Kunchok Kyab and Dolma Tso. Since his early childhood, he was a monk at the Sumdo Monastery and in 2010 joined Taktsang Lhamo Kirti Monastery to continue his Buddhist studies. In the same Dzoege region, Kunchok Kyab, a 29-year-old father of two, set himself on fire on November 30. He was forcibly taken away by Chinese security personnel, reportedly to a hospital in Barkham, where he passed away on December 1. The United States this week expressed its “deep concern and sadness” over the “increasing frequency” of self-immolations by Tibetans and blamed China for further exacerbating tensions in the region. Now, 93 Tibetans have set themselves on fire inside Tibet demanding freedom and the return of His Holiness the Dalai Lama since the fiery wave of protests began in 2009. The United States government has expressed its “deep concern and sadness” over the “increasing frequency” of self-immolations by Tibetans and blamed China for further exacerbating tensions in the region. In February 2009, Tabey became the first known Tibetan inside Tibet to set himself on fire protesting China’s rule. Since then 92 Tibetans have self-immolated, demanding freedom and the return of His Holiness the Dalai Lama from exile. The recent escalation in protests witnessed 28 self-immolations in the month of November and massive protests by thousands of Tibetans, including by school students. Otero, who also serves as the Under Secretary for Civilian Security, Democracy and Human Rights in the Obama Administration noted that senior U.S. officials have directly raised the issue of Tibetan self-immolations with their Chinese government counterparts. Last week, the U.S. assistant secretary of state for democracy, human rights and labor, Michael Posner met with family members of three Tibetan self-immolators in Washington D.C. Without revealing the identities of the family members, fearing Chinese retribution, the State Department said that Posner expressed Washington’s “deepest condolences and grave concern” over the critical situation in Tibet. Speaking to reporters in New Delhi last month, the Dalai Lama said China’s repressive policies and the unbearable situation in Tibet are forcing Tibetans to set themselves of fire in Tibet. "The unbearable situation in Tibet is the cause for these unfortunate events. I am very sad about the turn of events. These are symptoms of fear, hard line suppressive policy practiced by China in Tibet. The time has come for China to think more realistically," reporters quoted the 77-year-old Tibetan spiritual leader as saying. today we received your very generous donation of 494 €. I would like to thank you all in the name of TADRA Project and the 500 TADRA children !!!! The goal of TADRA Project is to save streetchildren and orphans in Tibet as the chances of survival at sometimes -30C are extremely low. With the help of your donations we are able to offer this children a place in one of our two children villages and change their desperate situation from desolation to hope and happiness. What better gift could we give this children. In our villages the children are welcome into a big and loving family of 500 children who all experienced a similar terrible ordeal in their young lifes. They all arrived with terror and pain written all over they sad faces but now thanks to you they won't have to fight for survival anymore, they will sleep in soft beds, receive food, medical attention and lots of love and understanding. Slowly they start to trust again and as a reward we can hear their wonderful laughter. But it doesn't stop there, we help to give them a chance for the future with our own TADRA schools they can visit and we support them up to University. TADRA village will always be their home and we look after them until they can support themselves. Our TADRA Project is purely voluntarily only the helpers in Tibet receive a salary in accordance with local custom. 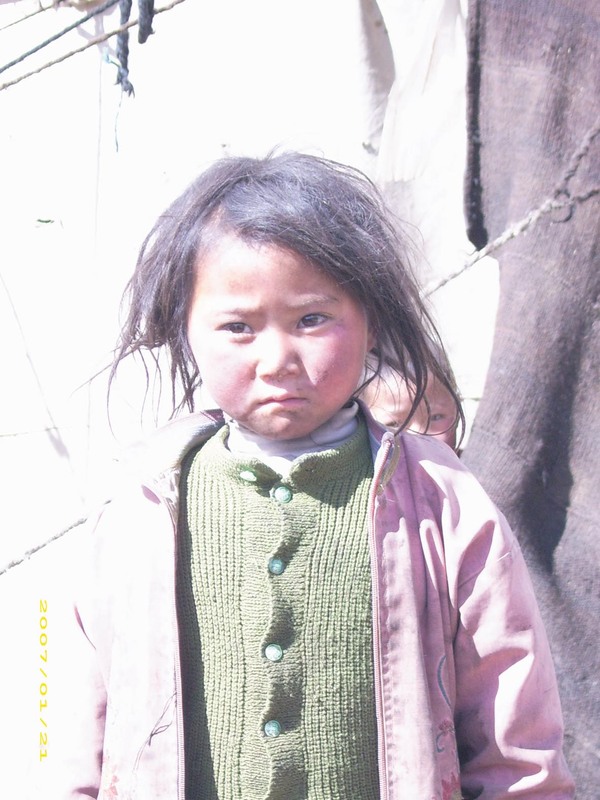 Even our travels to Tibet are paid privately to make sure that 100% of your donations benefit the children. So once again a big thank you for your donation which will make a huge difference for our children. I sent you two pictures of one of our children, one before its arrival in the village and the other one year after. No words needed......! Heute durften wir von Ihrer Organisation 494 Euro empfangen. Für diese grosszügige Spende möchte ich mich im Namen des TADRA-Projektes und den 500 TADRA-Kindern ganz herzlich bei Ihnen bedanken! Das TADRA-Projekt hat sich zum Ziel gesetzt, den Strassen- und Waisenkindern in Tibet zur Hilfe zu kommen. Bei Temperaturen, die oft unter – 30 Grad C fallen, haben diese Kinder denkbar schlechte Überlebenschancen. Den härtesten Fällen können wir so einen Platz in einem unserer 2 Kinderdörfer anbieten und damit ihr Leben von Dunkel auf Hell, von Trauer auf Lebensfreude und von Hoffnungslosigkeit auf Zuversicht verändern. Was kann man einem Kind schöneres und sinnvolleres schenken? Die Kinder gelangen so in eine grosse, liebe- und verständnisvolle Familie mit 500 Kindern, die denselben steinigen Lebensweg durchlaufen mussten. Sie alle kamen gezeichnet und mit freudlosen Gesichtsausdrücken ins Kinderdorf. Im Dorf mussten sie nicht mehr um die tägliche Nahrung kämpfen, durften in einem warmen Bett schlafen und erhielten Kleidung, medizinische Versorgung und viel Liebe und Verständnis. Langsam öffneten sie sich und fanden Ihr Kinderlachen wieder. Die Hausmütter und all die Geschwister kümmern sich rührend um die Ankömmlinge. Auch für ihre Zukunft wird gesorgt. Sie dürfen in die dorfeigene TADRA-Schule und dem Bildungsweg im besten Fall bis hin zur Universität folgen. Das TADRA-Dorf wird künftig für immer ihr Zuhause sein und wir begleiten sie, bis sie selber für ihren Lebensunterhalt sorgen können. wir Ihnen garantieren, dass 100 % Ihrer Spende den TADRA-Kindern in Tibet zugutekommen wird. Haben Sie herzlichen Dank für Ihre wertvolle Spende, mit der wir in Tibet sehr viel bewegen können! In a strange turn of events which have raised serious concerns over the well being of Golog Jigme Gyatso, a Tibetan filmmaker, Chinese authorities in eastern Tibet have framed murder charges against the missing Tibetan monk. Jigme was earlier believed to have been detained after he went missing under mysterious circumstances in September. He had assisted imprisoned filmmaker Dhondup Wangchen in secretly shooting his documentary film “Leaving Fear Behind”. Speaking to Phayul, Ajam Amchok, a Tibetan living in south India said Chinese officials in Kanlho have made an announcement offering 2,00,000 Chinese Yuan (US$ 32,116) for information on Jigme. The same announcement alleges Jigme of murder. It was widely believed that Jigme was rearrested after he went missing while returning back from the Chinese city of Lanzhou to Tsoe in Amdo, Tibet on September 20. Jigme was first arrested in March 2008 from Labrang Tashi Khyil and was detained for seven months during which he was brutally tortured and beaten. He was rearrested in March 2009, during which he was kept in custody for about 40 days. Since then, he has been rearrested many times. Jigme had assisted Dhondup Wangchen in secretly shooting his documentary film “Leaving Fear Behind” that shed light on the lives of Tibetans in China in the run-up to the 2008 Olympic Games in Beijing. The film, featuring a series of interviews with Tibetans talking about how China had destroyed the Tibetan culture, violated religious freedom and their undying reverence for the exiled leader His Holiness the Dalai Lama, was smuggled out of Tibet and later released worldwide. He is currently serving a six-year prison sentence for making the film and has been reported in poor health. DHARAMSHALA, November 30: In reports just in, a Tibetan man today set himself on fire in Shagdom region on Ngaba, eastern Tibet in an apparent protest against China’s occupation of Tibet. The Tibetan man has been identified as Kunchok Kyab, 29, from Akyi region of Zoegey in Ngaba. According to the exile base of Kirti Monastery in Dharamshala, the situation in the region, at the time of filing this report, is being described as 'very tense' with fears over eruption of major protests in the region. According to the release, a group of young Tibetans, after seeing Kunchok Kyab being taken away, immediately followed the Chinese police vehicles. The wellbeing and whereabouts of those young Tibetans are also not yet known. Kunchok Kyab has two children, a nine-year-old and a six-year-old. The deepening crisis inside Tibet has witnessed large scale anti-China protests and a series of self-immolations that has now seen 90 Tibetans set themselves on fire, since 2009, demanding freedom and the return of the Dalai Lama from exile. In fresh reports coming out of Tibet, a Tibetan man set himself on fire today in Luchu region of eastern Tibet in an apparent protest against China’s continued occupation of Tibet.